It's The Most Wonderful Time of the Year... Football Season! I live in a family of all boys. I have a husband, two sons, and even a boy dog named “Phillip." We kicked off a new season in life this fall with both boys being able to play flag football. I have always enjoyed watching football games, but with two of my own participating, it brought the enjoyment to a whole new level. We spend our Friday nights cheering on the Hawks, Saturday mornings playing flag football followed by watching college football in the afternoons, and Sunday after church is spent watching the Cowboys while finishing up laundry for the week. While both of my boys have found flag football to be their new favorite sport, my 6-year-old, George, shares an intensity (or I like to call it passion) for cheering on our favorite teams. Last year with our kids being older, we started a new family tradition of attending college football games on Black Friday. Since I am the only girl in my family, I knew a Black Friday shopping tradition was not in the cards for me so I wanted to start something that would keep the boys excited no matter their age. Our first experience was watching TCU vs. Baylor (my husband is an alumni) in Fort Worth. The whole family was decked out in hunter green and gold and cheering loud and proud for the Bears. While we didn’t win and almost melted from unexpected November heat, we had memories and a sunburn that we have talked about throughout the year. While discussing what team to watch this year, George with his big personality and intensity said, “I want to see the Texas Longhorns and Lil Jordan Humphrey because they are my favorite!” We agreed that was a great idea only to find out that Texas was playing Kansas that day in Lawrence, Kansas. My husband and I went back and forth on the logistics of the idea and decided to go for it. 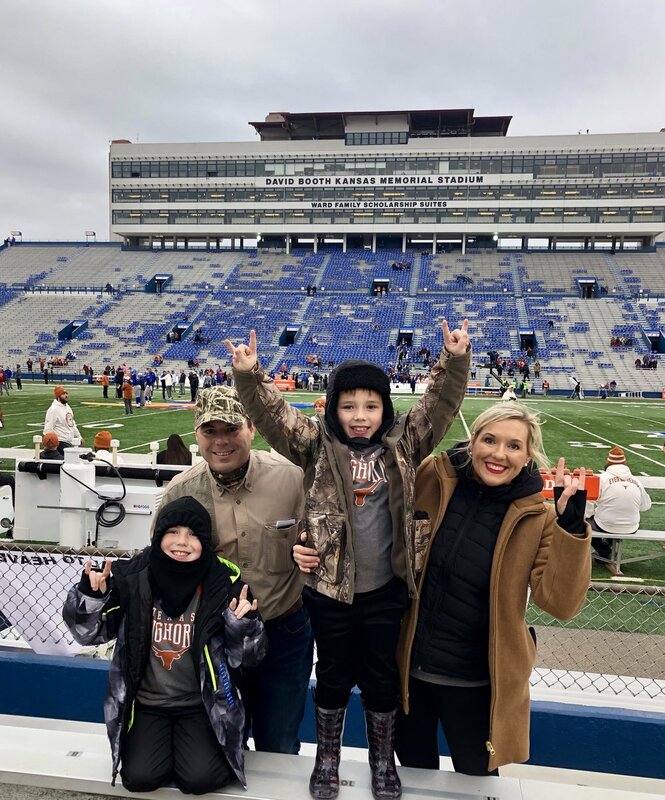 The reason for our commitment to follow the Longhorns all the way to Kansas was the drive was only about an hour longer than Austin, what else would take you to Kansas, the tickets were only $19 each, and I had points to cover the hotel room. Thanksgiving Day was here, and we drove to Marshall to have lunch with my husband’s family which added an additional hour and a half to our Kansas trip. Getting ready to hit the road at 2 p.m. that day, we thought maybe we had made a bad decision but we were pushing through with our Thanksgiving/Black Friday Road Trip plans. Along the way, we stopped and saw the Eiffel Town in Paris (Texas), visited a Veterans Memorial site, the largest praying hands statue in the world, and the kids learned that Oklahoma has a lot of casinos. On game day, we arrived in a lot of layers at Memorial Stadium in Lawrence, Kansas. The stadium is 98 years old, and you could feel the history in the concrete walls. We learned that KU is a basketball school and not a football school and had free range to sit anywhere someone was not sitting which landed us moving between the first five rows! That was the icing on the cake for George to get to see Lil Jordan and the rest of the Longhorn football team up close and personal. We are excited for another opportunity this weekend to watch our favorite sport at the Live United Bowl at Arkansas High Stadium. We are so fortunate to be able to experience a bowl game with college athletes without driving several hours. You will see the Meisenheimers cheering on the SAU Muleriders tomorrow at the Live United Bowl. I hope I see other football loving friends and families there.